The hottest craze in kids' crafts is at Michaels! 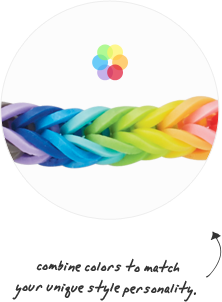 Check out how easy it is to make bracelets, necklaces, charms and more with The Original Rainbow Loom. Using colorful rubber bands, this simple loom provides hours of crafting fun for all ages. "After watching kids of all ages interact with it, I was amazed at how many goals could be addressed in one sitting. We can combine visual perceptual, problem solving/cognitive skills, finger dexterity, bilateral skills, hand strengthening, frustration tolerance and hand coordination for the kids that we work with… Run to your nearest store and get one. Hours of fun and extremely therapeutic. Great product!" Turn colorful rubber bands into bracelets, necklaces, charms and more! What do your bands say about you? From the maker of The Original Rainbow Loom®, the Monster Tail™ travel loom makes wider bracelets and designs. This mini Rainbow Loom® and metal hook set lets kids whip up fishtail designs in a jiffy. Perfect for bracelets, necklaces, lanyards and more. Learn to design the latest rubber band bracelets and accessories with our awesome selection of books. Stock up on your colorful elastic bands today!